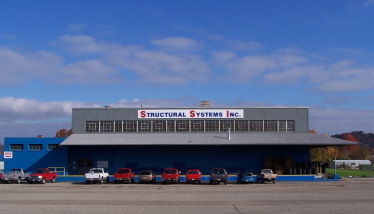 Structural Systems Inc. is a fabrication facility located in Nitro, WV. We have a 53,000 sqft shop in which we fabricate projects from 1 ton to 500 tons. We specialize in structural steel along with handrails, stairs, bar joists, metal deck, and other complex miscellaneous projects that require skilled craftsman to fabricate. Our engineering department takes care of all shop and field drawings, utilizing persons with years of experience in the structural and miscellaneous steel industry. We project manage all jobs in-house, so, when you call with a question you will talk with someone with complete knowledge of your project. We also are capable of design/build jobs. Structural Systems Inc.’s Project Managers are committed to extensive project specific coordination and open communication accepting new ideas, offering new ideas and encouraging “think out of the box” approach to assure we have exhausted all options in efforts to make a project as successful as possible. This approval ensures the most cost effective methods and facilitates the most achievable productive schedules. We fabricate structural and miscellaneous steel (stairs & rails) for all commercial, industrial, and residential, applications. We also supply bar joists and decking for related projects. Let Structural Systems Inc. help you on your next steel projects. Our 53,000 sqft fabrication facility handle most all your structural needs for the building industry. Our staff is well trained and highly motivated to meet our customer’s requirements. We can help in the design/build process of most structures; and you will be conversing with people who know the industry well, with combined industry experience of over 75 years. So, the next time you need a reliable and attentive steel company to meet your needs, please give us a call or stop by for a visit. We’ve been a leader in the design and fabrication of steel structures for over 50 years. And our people are the reason why. We’re not just a team of designers, engineers and manufacturers. We’re your neighbors. Your community. Your experts. More importantly, you can always rely on us for integrity you can trust. Structural Systems Inc. may not be the largest fabricator around, but we place high priority on customer service and satisfaction; so please consider us for your next project. You will be very satisfied with our capabilities. Built with HTML5 and CSS3 Copyright © 2019 Structural Systems Inc.